1. MOTHERS DAY IN WASHINGTON, D.C.
6:00 pm to 9:30 pm. Please note the time change. Information will be available Sunday night about activities on Monday. Mothers and supporters are meeting on Monday May 9 in Sacramento, California to bring attention to the broken family and juvenille court systems which harm victims of domestic violence and child abuse. Noon Assemble at the West side of CA State Capitol (10th Street between L and N Streets) to pray. 12:30 March from the State Capitol to the Appellate Court. 3:00 Assemble in the Committee Room at the Capitol. Assembly Member Fiona Ma is the keynote speaker. Please join us on May 9, 2011 at the California State Capitol. Our mission is to bring attention to the issue of how our broken family and juvenille court systems are harming victims of domestic violence and child abuse and to demonstrate to the public the severity and extent of the crisis in our family and juvenile court system and other corrupt court systems throughout the country. Second, we are assembling, along with our legislators and experts in domestic violence and child abuse, to discuss possible ways to end the crisis and bring justice to those whose rights have been violated. 12 Noon: Meet on the South side of the California State Capitol to assemble and pray. 1:30 to 3 pm: Demonstrate in front of the front of the Capitol/Lunch Breaks worked in there somewhere. 3 to 5 pm: Assemble on the south side of the Capitol for speakers and panel discussions. Check out our “Links” to get information on organizations that will be supporting us at the march, to connect with us on Facebook, and to listen to the 4Justice radio show featuring our event! See our “Messages” for more detailed information about the event and how you can help! Join Us On Maui For Mother’s Day! Mother’s Day is fast approaching, this Sunday, May 8th – time to buy “the perfect card”, send some flowers, make brunch reservations or dinner plans! Our earliest recollections of Mother’s Day likely include memories of construction paper cards made at school, held together with Elmer’s glue, written in crayon or magic marker and perhaps a little glitter; flowers hand-picked from a neighbor’s yard and noble attempts at making a pancake breakfast in bed. Even though these efforts were done for Mom, the reward was actually ours as we waited in excited anticipation of her response: the smile that makes you swell with pride knowing you did good and the embrace of unconditional love that only a mother’s arms can provide. For victims and survivors of abuse, however, these memories are only hopes and dreams – Mother’s Day for those impacted by domestic violence and child abuse is an annual day of agony where outstretched arms remain empty and feelings of isolation, loneliness and loss are all-consuming. For mothers and children who have lost each other through domestic violence, Mother’s Day is particularly excruciating as the day will hold a very painful journey to a gravesite where regrets and even happy memories will torment those left behind. Death is not the only way that mothers and their children are separated through domestic violence however. For those moms “lucky” enough to have “successfully escaped” domestic violence, too many lose custody of their children to their abusers in subsequent child custody and visitation proceedings in family court. The Leadership Council http://www.leadershipcouncil.org conservatively estimates that 58,000 children PER YEAR are ordered into UNsupervised contact with physically or sexually abusive parents following divorce in the United States. While Hawaii has some of the best domestic violence statutes in the country (like 571-46(9) that I mentioned in a previous article which says a perpetartor of family violence should not be awarded sole or joint custody of the children) the problem is that domestic violence is either ignored, marginalized, minimized or litigated away so the statutes designed to protect women and children from ongoing abuse never get applied. The result is that domestic violence survivor moms – some of the best and most protective parents around – become childless after having their children (sometimes literally) ripped away from them. This Sunday, May 8th, I will be joining a group of domestic violence survivor moms and their supporters on Maui from 9:00am – 12:00pm in the K-Mart parking lot at the corner of Haleakala Highway and Dairy Road for a sign waving and peaceful demonstration calling attention to motherless children and childless mothers taken away from each other through domestic violence and/or family court proceedings that ignored evidence of abuse. PLEASE put on some purple (the color that represents domestic violence) and come out to join us or give a drive-by and a honk to let these brave and protective parents know that your heart is with them. A petition will be circulated demanding that the law be applied and adhered to in cases of violence and abuse so that the children born into such situations will remain in the arms of their protective parent rather then the clutches of an abuser. So please come join us and help to spread the word to show your support for our makuahine and keiki this Mother’s Day so that by next Mother’s Day, outstretched arms may be received by embraces. On Friday, May 6th , Strengthen Our Sisters will hold their 6th annual Mother’s Day demonstration in front of the Passaic County New Jersey Courthouse, 401 Grand Street, Paterson, at 12:00 noon. Joined by mothers all over the world, the demonstration will consist of mothers and their supporters marching with empty baby carriages to protest the trend in court rulings that award custody to batterers and child molesters on a regular basis. “All too often this happens because batterers can afford high priced attorneys who know how to manipulate the victim and the system. Contrary to popular belief, According to a Presidential Task Force Domestic Violence Report in 1996 ; state’s : “70% of Batterers who seek custody of the children get full custody.” Fatherhood Funding receives in excess of $500.000.000.00 to fix bad dad, these funds are diverted and used to take mothers children and give them to the abusive father under the pretense of ‘involving fathers’ in their children’s lives. Mothers across the Nation call for a Congressional investigation into the failure of family courts to protect children and the potential fraud, waste and abuse of taxpayer dollars. Obama (and Congress) you are killing children with the tax payer’s money. STOP FATHERHOOD FUNDING NOW! During the past two decades, mothers have been losing custody of their children (even nursing infants) in increasing numbers to fathers who are convicted or identified batterers, child molesters, drug addicts, gang-bangers and felons . Family courts force children into the custody of abusive fathers at alarming rates , allowing these men to continue controlling and abusing their victims .Mothers who stayed in abusive relationships to “protect” their children were charged for ‘failure to protect’. Mothers who left their abusers and tried to be “friendly” and co-parent in the face of ‘ Mandatory Shared Parenting Laws ‘, lose their children to abuser’s and Mother’s are being ordered to ‘Supervised Visitation’ or are completely denied ANY contact with their children.Sandra Ramos who founded the first shelter for battered women in North America, and who is also a professor at William Paterson University and Ramapo College is asking that people think about what they will be doing on Mother’s Day and to try to imagine how they would feel if their own children had been taken from them and placed with dangerous perpetrators. She posed the question, “How would they feel if they had to wake up each morning not knowing what horrors or tortures their children might be enduring, with the knowledge that they could do nothing legally to protect them?” In addition, the mothers are forced to pay child support or go to jail.“We must raise public awareness about the terrifying power of the courts,” Ramos said. “We have a comprehensive and growing file of cases where children have been taken away from caring non-abusive loving protective parents and placed with the abusive parent. Far too many children have been placed in harms way by court orders. We are asking for re-examination of cases by an unbiased review board when judicial misconduct has been reported.” There has been a wide range of interest nationally in this phenomenon and was addressed at the Mother’s Custody Conference in Albany, NY in 2011. Ramos who speaks throughout the country and was the keynote speaker at the first World Conference of Women’s Shelters says that she has been besieged with calls and reports from mothers who have lost custody, or are in danger of losing custody, everywhere she goes.“Research shows that half the men who abuse their wives or girlfriends abuse the children too and there is evidence to show that such abuse escalates post separation. Children who grow up with abuse are more prone to behavioral problems, depression, eating disorders, suicide, school failure and increased drop out rates, juvenile delinquency, substance abuse, adult criminality, and are more prone to becoming involved in abusive relationships as adults,” says Mo Therese Hannah, Ph.D., Associate Professor of Psychology at Siena College,. Dr. Hannah, whose professional focus is on couples therapy and dynamics of abuse, was the chief organizer of the Mothers Custody Conference.People are encouraged to bring signs for the protest as well as empty baby carriages. Buttons will be handed out saying “The Court is the Cash Register and Children Pay the Price” , as well as “ Children should be Seen Heard, Believed, and Protected .” People who wish to participate should call, 973-831-0898 or email info@sosdv.org It is hoped mothers will come forth with their own stories which will be filmed at the protest. The event will be filmed by Jackie Aluotto, film producer personified of Pick it Up Pictures. 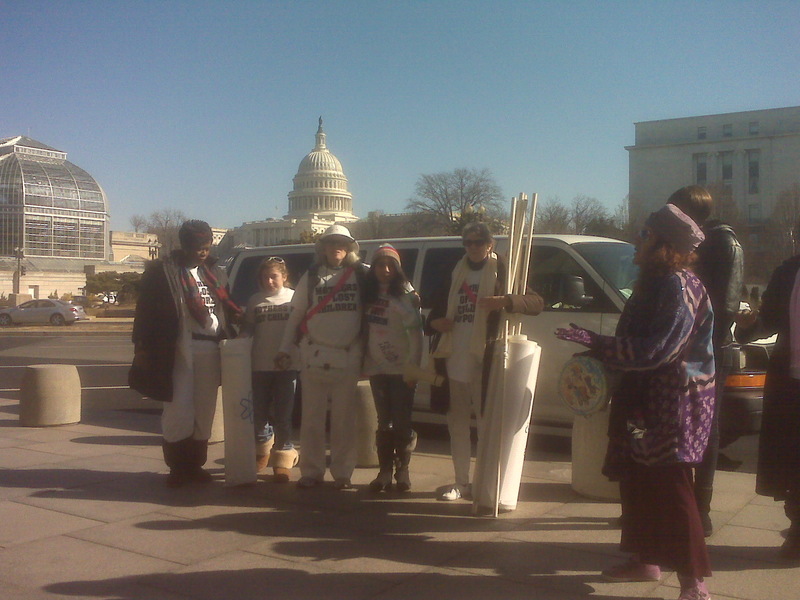 The event will have marching, drumming, singing and a speak out.Following this demonstration we will be joining the Million Mom March Mother’s Day 2011, at 1600 Pennsylvania Ave. Washington, D.C .Mother’s of Lost Children, American Mothers Political Party, Courageous Kids, Mothers For Custodial Justice, Mothers From the East Coast to the West Coast and more Mothers and Organizations are Marching in Washington D.C on Mother’s Day, Sunday May 8th, through Monday May 9, 2011. UPDATE: New hours for the Vigil to be held on Mothers Day, May 8th, 2011. There will be a speakout scheduled to start at 6:00 pm in front of the White House. This will be followed by circling the White House, going down 17th St. over to Constitution Ave. then up 15th St. until we return to the front of the White House. This will be what we did last year, but just continues the journey completely around the White House complex. A candlelight vigil will then begin, being held until 9:30 pm. Bring your signs, banners, and candles (battery operated if possible). We will have a few to hand out, and will have some “Mothers of Lost Children” t-shirts also. If you have any questions, please email “mothersoflostchildren@gmail.com”. Contact phone number is (317) 455-5827. This change will hopefully allow this vigil to happen without any problems. A protest is still being worked out for the front of the U. S. Department of Health and Human Services at 11:00 am on Monday, May 9th. Stay tuned for more information coming on that. Thank you and we hope to see you there! before they threatened to have us arrested. 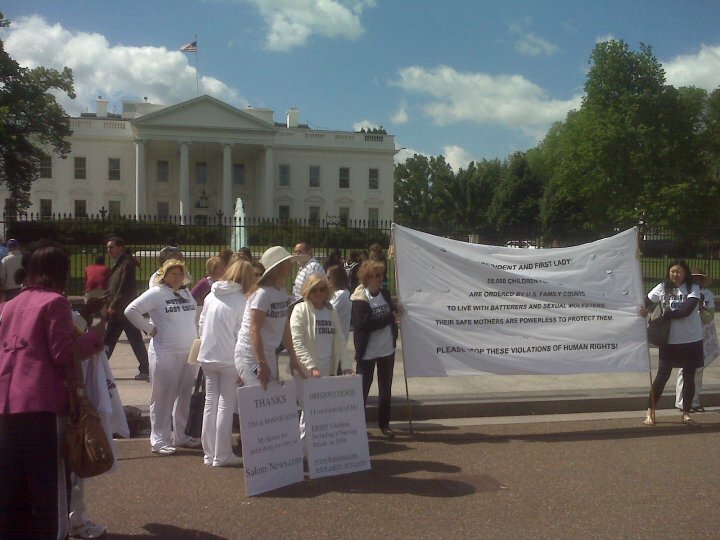 We are going to be at the White House again on Mothers Day 2011, to protest the use of taxpayer funds to support fatherhood initiative programs, which have been effective in helping abusive fathers in taking custody of children away from their victims. Extra accommodations have been secured at the hostel we usually stay at for these events, which have been going on about three times a year, so if you can’t find a place to stay, email mothersoflostchildren@gmail.com about this. This is a clean, safe place to stay and costs only $38.00 a night (breakfast included!). Some of the organizations taking part and supporting the Silent Vigil include Mothers of Lost Children Chapters in California, Indiana and Delaware, the California Protective Parents Association, the Center for Judicial Excellence, the National Organization for Women, and the Battered Mothers Custody Conference. Many other organizations are also included. If you cannot attend the event in Washington, D.C. on Mothers Day, something will be planned in Indiana that you can attend. Other states will be holding similar events, and Ms. Hodge will be coordinating a lot of these as she has publicity contacts nationwide. So stay tuned for more information…hope you can attend this year’s event! Last year was very successful in many ways. There were hundreds of mothers in vigil. It needs to continue until the practice of giving abusers custody of children stops. This entry was posted in Announcements and tagged Mothers Day 2011, Mothers Day California, Mothers Day Washington DC. Bookmark the permalink.